No more ducklings, they’re Ducks! At 6 weeks old you would never know that they aren’t full grown. They are the sweetest, messiest birds. I have fallin in love with my waddley friends. They were moved outside at the beginning of April. They out grew their brooder box quickly. 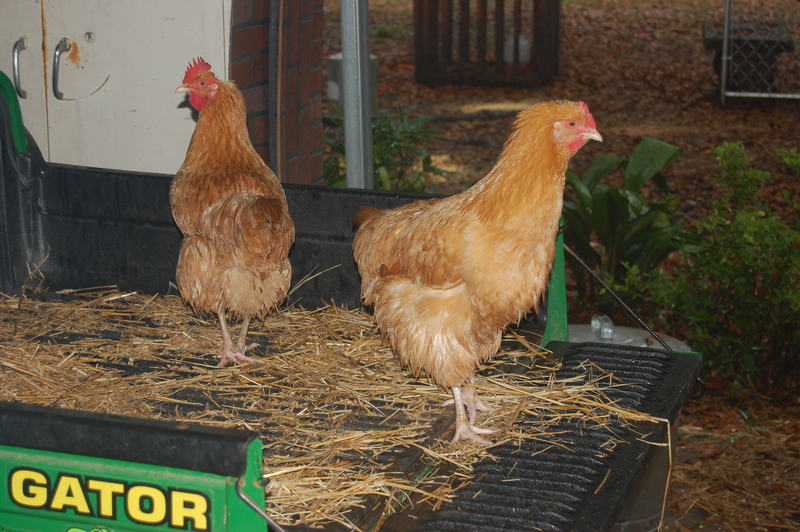 But with the help of an old truck camper shell and a heat lamp they have adjusted really well to being outside. Because of their size, I don’t worry about snakes and so far we haven’t had any issues with predators. I did secure their cage with netting and chicken wire so I could sleep at night. If I choose to raise an animal, any animal, you can believe that I am going to do everything in my power to make sure they have everything they need to thrive and are protected. Since these picture were taken, we have added water to their pen for them to enjoy submerging their heads and taking a bath. It changed their world, make no mistake about it ducks need and love their water. We lost our boy recently. He was our caretaker, protector and our best friend. Kain would have been 15 years old this May. He was a pitbull, but he didn’t know it. He loved a ball, he would pick up my doves, but drew the line at ducks. He was my constant companion and best friend. Losing him was no different than losing a family member. I have no doubt where he is and I know that he will wait for me….he will be missed…but never forgotten. Now that I am an old hand at Chickens, I wanted to add to our little hobby farm and raise some ducklings. Cute lil fellows and boy are they messy. I have had them now for a couple of weeks and things are going well. A couple of things that I have learned, they really like water. I know they are ducks, but I didn’t realize how much water they would use in a day. The waterer in the picture holds 1 gallon of water. I change it two times a day, morning and nights. I also clean their brooder twice a day as well. They have to have water to eat and they have to keep their nostrils moist. But be careful of the container that you use, because they can drown in the first few weeks of their lives. They can be fed chick starter food non-medicated. But they need a little more niacin than chicks do so you have to add a supplement to their food so that their legs grow strong and healthy. It is recommended to give them brewer’s yeast for the additional niacin that they need. Also, give them oats with their food too. This will ensure that their wings grow strong. But not too much, you want their primary diet to be the chick starter/grower. Also, they love greens (kale, dandelions, grass). It is a special treat for them and they are so appreciative. A bathtub is a great place to keep them, but if you’re like me you don’t have an extra bathtub laying around. So you have to improvise. I went to Walmart and bought a tote big enough to fit into the old cabinets that I am using to house them. I lucked out and bought one that fit perfectly. We cut an opening that they can easily come in and out of and it worked great. Now the wet can be wet and the dry can be dry. I can already tell in two weeks that they will out grow this very soon. So I got to come up with another plan and soon. So far this has been a fun experience and the ducklings seem happy. I will keep you posted as they grow older and bigger. 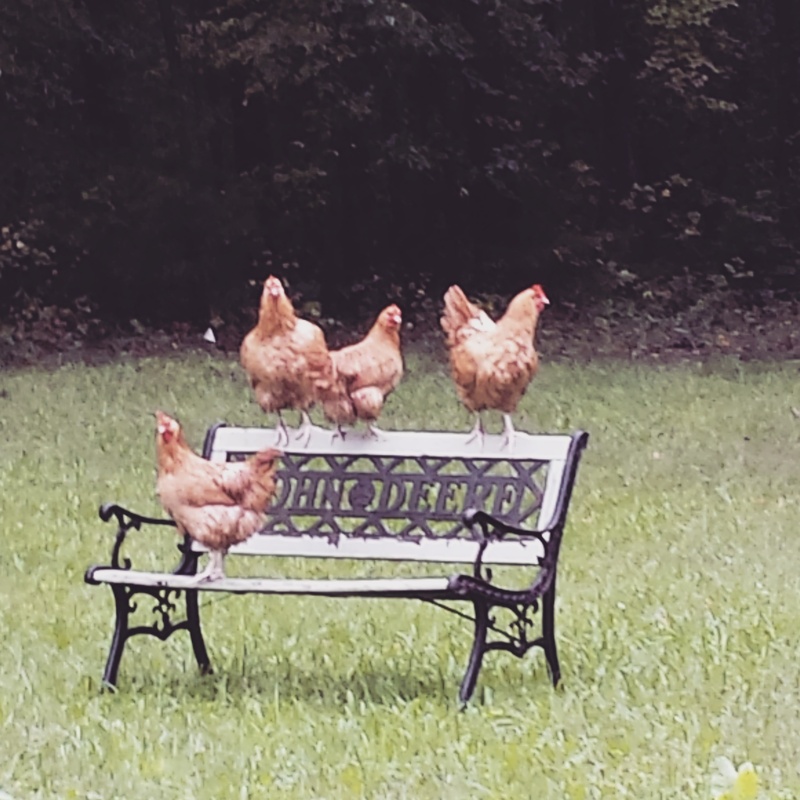 The chickens are running for the hills…or any place dry! Who’s been doing the rain dance…. Not only does this time of year bring us Muscadines and Scuppernongs, but also the wild growing Persimmon. 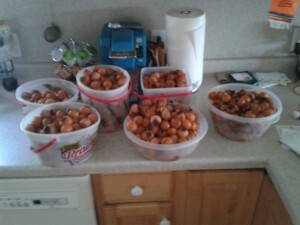 Check out the cool Persimmon recipes for an old time favorite. My dog Kain will sit under the tree and eat himself sick. Combine sugar, milk, butter and persimmon pulp in a heavy saucepan. Cook over medium heat, stirring constantly, until the candy reaches the soft ball stage (236F)*. Remove from heat, add marshmallow cream, nuts and vanilla. Pour into buttered pan. Cool and cut. *Candy has reached the soft ball stage when a bit dropped into a glass of cold water forms into a ball. Preheat oven 350 degrees. In a large bowl blend sugar and oil; add eggs and persimmon pulp.In a separate bowl, sift together flour, baking powder, baking soda and spices; add nuts and dates then mix well. Stir flour mixture into persimmon mixture. Turn into two greased and floured loaf pans. Bake for one hour or until done, testing center with a pick. Turn out on wire rack to cool. Freezes well. Combine persimmon pulp with sugar. Beat in eggs. Mix in milk, then butter. Sift or stir flour with baking powder, cinnamon, nutmeg. Mix with persimmon mixture. Pour batter into a well greased 9-inch square cake pan. Bake in a 315-325°F oven for approx 60 minutes or until knife comes out clean.